...not if you know all the ins and outs of building practice and legislation you don’t! …but buying a property normally represents the largest single financial commitment most people make in their life. It is also one of the most stressful and fraught with risk. Your mortgagee will have a valuation carried out for their own purpose. All too frequently this is referred to as a valuation survey - it is not! - it is a brief assessment of the property’s suitability for loan purposes. The best way to protect your position is to reach a reasoned and informed decision through the expert opinion of an independent qualified surveyor. This minimises the legal and financial risks before you commit yourself. A survey is not expensive, but with so many other costs involved in the purchase, there is a temptation to cut corners, relying solely on the mortgage valuation. This is misguided and possibly reckless. Commissioning your own “independent” survey is the best way to avoid costly surprises - after moving in. In some cases, the surveyor’s report may enable you to renegotiate the price. A survey will give you peace of mind, even if there are no defects with the property. So why choose an “independent surveyor? Today, most residential valuers and surveyors work for financial institutions or corporate organisations. Often the surveyor is unknown, so it is not always possible to speak with them. Whilst you may have little or no control over who carries out your mortgage valuation, you should definitely have control when it comes to your own survey, be it a Homebuyer or Building Survey. …so you can speak directly to the surveyor before you instruct. This gives you total control over what goes on. Then decide if the level of knowledge and expertise meets with your expectations. A mortgage valuation is based on a brief assessment of a property and only answers the mortgagee’s questions concerning the appropriate security for the loan requested. In your own interest it is advisable and prudent to arrange a full survey by your own surveyor. The Consumers’ Association Which? Magazine and the Council of Mortgage Lenders both give this advice. Valuations by a Chartered Surveyor are frequently required for private purposes eg matrimonial, probate. These contain similar information to a mortgage valuation but in brief report format as required by the RICS. Again, it should be noted that a valuation is not a survey. We are also experienced in carrying out valuations for lease extension premiums and collective enfranchisement valuations (where leaseholders wish to buy the freehold). We are members of the Association of Leasehold Enfranchisement Practitioners (ALEP) and listed on the Leasehold Advisory Service website under leasehold practitioners who specialise in this area of work in London and South England. The Home Survey is an economy package, suitable for property of conventional type and construction in reasonable condition. The reporting style is concise, advising on the general state of repair and condition of the property and permanent outbuildings, focusing on any urgent repairs; significant defects; further action required prior to purchase; obvious potential hazards or other matters likely to materially affect the value and legal matters which your legal advisers should include in their enquiries. We can also provide an opinion of the Market Value and the estimated reinstatement cost for insurance purposes. See our Easy Reference Chart. then consideration should be given to obtaining a Building Survey. The Building Survey report covers similar issues to a Homebuyer, but is more detailed and comprehensive. It includes details of construction, materials, defects, condition, technical discussion, advice on problems and remedial work, repairs and maintenance, plus any other defects the surveyor considers helpful and appropriate. A Building Survey does not normally include a valuation and estimate of the reinstatement cost for insurance purposes but these can be provided, for an additional fee. See our standard Terms of Engagement for this service and the RICS leaflet titled Choosing between surveys, which discusses the basic differences between the HSV and Building Survey. If you are obtaining a mortgage or having a RICS Homebuyers Survey and Valuation (“HSV”), the report obtained by your mortgage lender or included in your HSV will include a 'building insurance reinstatement value'. However, if you are buying a property without a mortgage or a HSV, you should obtain your own 'building insurance reinstatement value'. This can be added to a building survey at an additional cost if required. According to the insurance comparison web site confused.com about 30% of people are over-insuring their homes (See ‘Timesonline’ article - to come). However there are likely to be a signifcant number who are underinsured. However, if you are buying a flat, you may find that there is a block policy in place. Your Legal Advisers should verify that the cover is as would be expected from a normal policy without exclusion apart from normal policy excess. 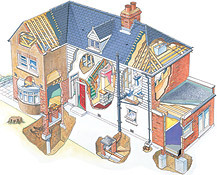 If you or your adjoining/adjacent owner(s) intend or need to carry out building work which involves a party wall or floor shared with an adjoining property, building on a boundary, or excavating near a neighbouring building, you must first find out whether the works fall within the terms of The Party Wall etc. Act 1996 . If it does, then before the work can be undertaken, the owner proposing the works must give the adjoining owner(s)/freeholder(s) 2 months notice and obtain their consent, or obtain a Party Wall Award. If either of the above apply to you, we can help.